Welcome to a brand new interview series, where our best human interviewer, tman507, has tracked down some of our current artists and fired some questions at them. 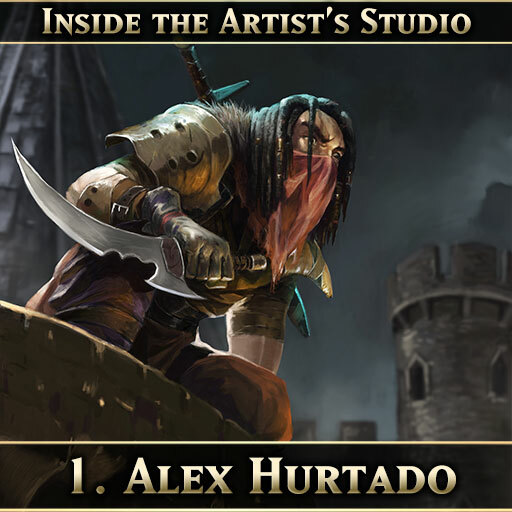 In this edition, tman507 has cornered Alex Hurtado, who produced all of our Warrior and Mage artwork for LLP2 and various other Lost Lands cards. Q: Tell us a little about yourself, such as who are you, where are you from, your age if you like, and any other bits of info you'd like to share. My name is Alejandro Hurtado, from Guadalajara, Jalisco, Mexico. I am 35 years old and freelance artist. Q: Tell us a bit about your art background, such as when and how did you start, education, etc. I've been a painter all my life since I was in kindergarten, when I took my first brush and made my first painting. Then I saw a lot anime and cartoons like Mazinger Z, Saint Seiya, He-Man and Thundercats and they inspired me greatly! I studied the Graphic Designer Bachelor's degree. Q: Have you or do you work in more traditional physical mediums (e.g. painting), or do you mainly like to create digitally? If so, what about digital attracts you to that medium? Yes, I started painting traditional, but now it is a little difficult to paint in that way and it takes more time to create, but with digital we can be more faster in general. I almost do not paint at all in traditional sadly. Q: Have you done work for other CCG/TCG or video game projects? If so, what games? Yes I had worked in Gameloft studio in Mexico (they had a studio there for 5 years) and then I started a new adventure as a freelance artist, and I've worked with Spell of Genesis, Hex entertainment, Phageborn, etc. Q: Do you play any video games in your free time? Maybe some of the games you've done work for (Shadow Era is a pretty great one if I do say so myself.)? Or what other hobbies or recreational activities do you take part in during your free time? The truth is that I almost don't play any games. I have Shadow Era on my device but it's so hard to make time. I have a kid aged 4 who takes the rest of my time when I'm not working. Sometimes I play Nintendo Switch with my child, but that's it. Q: What is the process of creating each card artwork like? Gondorian gives you some sort of general prompt of what he's looking for, I assume, and then what? How much do you go by the prompt and how much do you go by your imagination? Well, yes, Gondorian gives me some sort of general prompt and then I start to see some images on Google and make an ideas brainstorm with 3 sketches for options and then I show to Gondorian and he gives his feedback and shares with other team members and we choose the best sketch to move forwards with. Q: Is Gondorian pretty strict when it comes to what he's looking for with each art? Or does he just let it be mostly up to what you imagine? Hehehe I can’t answered in that way. I just can say that he is a very cool guy and I think that we have made an awesome team making artwork for Shadow Era and I enjoy a lot working with him. Q: For any aspiring artists out there, what are some of the devices and software you use in your work? I use Photoshop and iPad Pro with Procreate. It's an awesome tool for working anywhere. Q: What is your favorite part of the creative process? Planning out a concept? Delivering the final piece? My favorite part is see the final piece and remember all I learned making that, and it's quite emotional to see it finished. Q: How long does the average Shadow Era artwork take to complete? I think between 10 and 15 hours. Some time I am more inspired and the flow works and it's faster; other times I need more time to get what I want! Q: What are your favorite things to draw (e.g. warriors, creatures, environments, sci-fi, etc.)? Q: Do you have a favorite artwork in Shadow Era (one of your own or another that you have seen)? Q: Lightning round! Favorite food? Favorite animal? Favorite place? Favorite movie? Favorite song? Q: And finally, do you have any sites where people can have a look at more of your work? Yes my site is https://www.artstation.com/alexhurtado. Thanks so much for your interest to know about me. Very cool interview to hear what it takes to bring concepts to reality. Would love to see more of these! 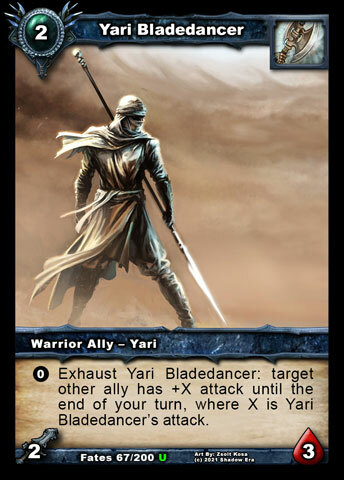 As an aside, I’m curious which artist has provided the most artwork that has become a card? good job on the interview! Glad you all enjoyed the interview. There are more of these to come. On your question about who has provided the most SE art, the stats over at the Artists page on the Wiki indicate that Kitt Lapena has done 164 artworks (most from Call of the Crystals), and Trias Digital has done 136 (mostly from Dark Prophecies). Be sure to check out the link that was provided in the interview. You didn’t show him some of the bad art we have and thank him for being here to contribute the awesome work he has done so far. Do not know if he reads this but every artwork this guy has done is outstanding. Hope he stays on board.